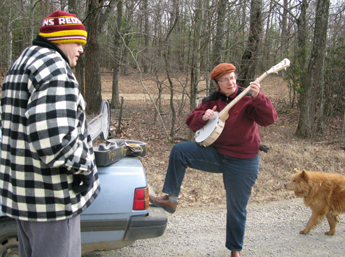 can you be out helping a friend collect litter and run into a neighbor who jumps out of her car, pulls out her banjo and plays you a song in the middle of the road. Yes, only in Floyd. I cannot imagine that happening here, but then, maybe I run in the wrong circles! Just another reason I'd love to live in Floyd. Blessings to you, Colleen! Patry! Big smile and xo. Good karma finds its own level! I'd like to try Floyd out sometime! It looks like you were walking Jasmine too?? I wish I could. This sounds wonderful! fabulous serendipity. take life by the hand and lead it on a merry jig.